While we were getting our bikes ready, we tried to figure out where we were going to ride. We decide, since there was still major snow-age on the road and sidewalks, we’d take it easy and ride through the neighborhood to a park that was about a mile from the house. Also, it wouldn’t be too much for my 4-year old, but she’d still have fun. Once we were on the road, we decided to create some cool challenges for the older two kiddos, so they raced and goofed around, then they found a decent sized snow bank, backed up to give themselves plenty of room to gain momentum, and rode over it several times, laughing and racing along the way proving that winter riding is a total blast! At one point I asked the older kids to stay by my younger daughter and I gave the snow bank a try myself. I was a little nervous, but it was only about a foot and a half of snow at its highest point. I zoomed up the front of the snowbank a little jittery, but was exhilarated and decided to go two more times. It was absolutely hilarious to find myself, being a 46 year old grown woman, giggling and racing up and down the snow bank on my bike. It was awesome! We decided to try it with a couple more snow banks along the way, which made the ride to the park feel like a gigglefest of fun and adventure. Even the little one rode over a small patch of snow on the sidewalk and felt like she was a daredevil extraordinaire. Once we reached the park, we decided to follow the path around and do some sightseeing and people watching. There were lots of other people out cycling and we waved and chatted a little here and there about how lovely it was to be out riding again. We rode around the park a couple of times, then stopped so the kids could play on the equipment, had a snack and headed back home where I made some cocoa and we told my husband all about our afternoon of cycling adventures. He cracked up when we told him about the snow bank and immediately wanted to go back out and try it for himself - so we did! My outing with my kids helped me to decide I was not going to wait until spring to get out and ride with my kids - that cycling isn’t just a warm weather activity/sport! 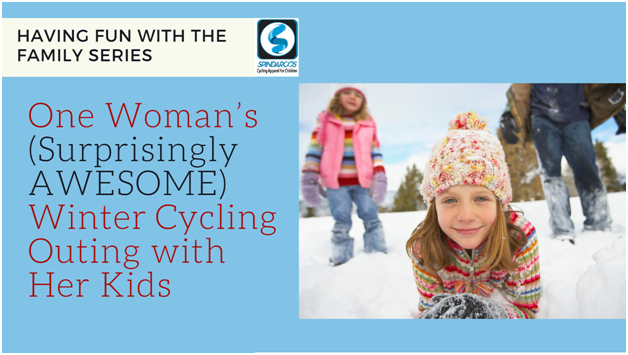 With the proper gear and attitude, cycling in the winter can be an amazing experience, one that me and my family won’t soon forget.